Adriana Páramo Pérez was born in Galicia, Spain in 1985. 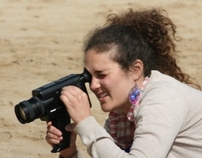 She achieved a BA degree in Audiovisual Communication in 2007, specialising in scriptwriting and directing from the University of Santiago de Compostela, Spain. Wanting to develop her technical skills, she enrolled onto the MA Filmmaking at The London Film School. She graduated in 2010 as director of the short film Stone Island. After this, she had the opportunity to work in film shoots in different countries such as Morocco and Italy. In 2012, she was accepted in the European Volunteer Service and went to Poland for 6 months to work as a cultural programmer and filmmaker for the organisation Fundacja Projekt: Kultura. Working and living in different countries enabled her to meet other cultures and traditions and to develop a great team spirit and an open mind. Nowadays, she works as a production manager and is also involved in different arts organisation collaborating with their artistic projects.